ORRVILLE — No matter where Bob Knight travelled in climbing to the top of the basketball world, he never forgot his roots in Orrville. From coaching three NCAA championship teams at Indiana, to leading the 1984 USA team to an Olympic gold medal, to holding the all-time Div. I record for coaching wins at the time of his retirement in 2008, Knight stayed close with hometown friends and supported the Red Riders at his alma mater. Orrville showed its admiration and appreciation for the coach nicknamed “The General” Saturday night. 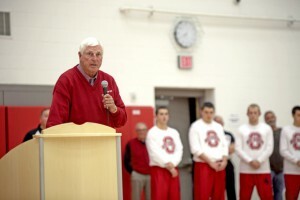 The 1958 Orrville graduate was on hand as Bob Knight Gymnasium was dedicated in his name between games of a basketball doubleheader, which the Orrville girls won 70-31 over Northwest and the boys lost 41-40 against Coventry. “This is a tremendous honor for me — the fact that I get to share this with Steve Smith and that it comes from my hometown,” said the 73-year-old Knight, as he addressed the sellout crowd at halfcourt between games in the sparkling new 1,250-seat gym. Orrville will recognize the winningest man to ever coach the Red Riders at its next home game against Wooster on Dec. 13 when Steve Smith Court will be dedicated. The late “Smitty” coached the Orrville boys to three state titles (1992, ’95, ’96) and 456 wins over 25 seasons. Knight compiled a 902-371 record for a .709 winning percentage over 42 combined seasons at Army (1965-71), Indiana (1971-2000) and Texas Tech (2001-08). He retired as the all-time leader in Div. I wins and now trails only Mike Krzyzewski (957 wins entering the season) and Jim Boeheim (920), who are still active at Duke and Syracuse, respectively. reflections of my having been brought up in one of the greatest towns in the United States. Orrville athletic director Kent Smith introduced Knight, then superintendent Jon Ritchie officially named the gym after him and current team captains Trevor Summers, Kyle Ritchie, Chad Harrison and Joel Zook presented him a framed plaque. Former classmate Bob Shonk and longtime friend Jerry Davault then spoke, with Shonk sharing his thoughts on Knight and Davault reading a letter former Ohio State teammate John Havlicek wrote about him. More than a dozen former classmates were on hand to help honor Knight, including former teammates Bill and Bob Shonk, Ron Birkbeck, Warner Harper and Earl Maag. Retired OHSAA commissioner Clair Muscaro was also among those in attendance. Knight provided color commentary on a college basketball game in New York City Friday night and then flew into Ohio for the special ceremony Saturday. He was accompanied by his wife, Karen, and sat with longtime friend Doc Rhoads for most of the doubleheader. He took time to talk with well-wishers throughout the night and sign autographs. Athletic director Kent Smith said Knight inquired about making a donation to the Orrville library. He’s already dedicated his time and money for countless other projects at the school over the years. However, as Knight spoke to a crowd that seemed to hang on his every word, it was clear he feels like he’s gotten more in return from his hometown through the years.